Pea, rice, coconut, pomegranate and pumpkin protein. The pomegranate is regarded as a superfood because of its healthy properties. Clinical research has uncovered the reasons why this fruit has been worshipped since ancient times as a symbol of fertility. Its secret lies on its polyphenols content, in particular with punicalagins. These valuable substances protect the joints, heart, and prostate. The pomegranate, or punic granatum, is one of the oldest known fruits. It originally comes from Persia and it is very rich in nutrients. Pomegranate dietary supplements are rich in punicalagins, the essential ingredient that gives it its extraordinary properties. Due to its extraordinary properties it has long been revered as a symbol of health, fertility, and longevity. For more than eight thousand years it has been used in traditional medicine, but so far the West had not paid enough attention to it. Due to the spectacular results of the clinical research from 2016, it is currently regarded as a superfruit. Is it better to eat fresh pomegranate or to use pomegranate supplements? The pomegranate is a "healthy fruit" and, among other benefits, it reduces the risk of several types of cancer and cerebrovascular attacks. In addition, it prevents the harmful effects of chronic inflammation and oxidation, inhibits the development of diseases during menopause, helps with prostate problems, cholesterol issues, and weight reduction. It also promotes the optimal functioning of the brain, the proper condition of the joints, and helps to keep the immune system in perfect condition, as well as preventing arthritis, infections, and Alzheimer's disease. This fruit is different from all the others in its medicinal qualities, which include its antioxidant properties, its ability to regulate hormones, and its antibacterial and antiviral effects. For these reasons it should be added to the diet by means of a nutritional supplement. Clinical studies have shown that this fruit is one of the foods with the most properties and benefits for the organism. This is due to its polyphenols content which protects the cardiovascular system and promotes the proper functioning of the nervous system and a good state of the bones. Pomegranates are rich in valuable nutrients, namely their phytochemical ingredients, flavonoids, and polyphenols. A glass of pomegranate juice has more antioxidants than red wine, green tea and cranberry. 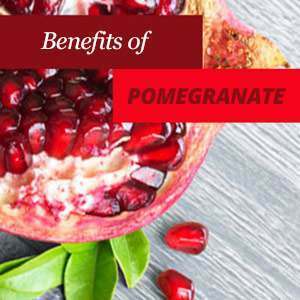 Punicalagins are polyphenols that are only found in pomegranate and have great benefits for the organism in general: they protect the cardiovascular system, reduce bad cholesterol, lower blood pressure, and increase the response time to heart blockages, reducing the risk of suffering from atherosclerosis. In addition, they naturally reduce blood pressure, which helps to avoid the risk of heart attacks or strokes. This fruit is also good for the heart and blood vessels in general and has other benefits: it helps to prevent various types of cancer, such as breast, prostate, colon, and leukemia. It also contains phytochemical elements that stimulate serotonin and estrogens, which reduces the symptoms of depression. It has been proven in laboratory experiments that it helps to increase the bone density in animals. Several clinical studies have shown how the intake of 80 mg of pomegranate as dietary supplements improves the good state of the health overall. Fresh pomegranate is not available in the supermarket all year-round. In addition, they are quite expensive and it is very difficult to eat the amount our body needs every day. The required amount of fresh pomegranate juice is around 500 to 700 ml daily. Pomegranate juice sold in a bottle or "tetra pak" has a very low proportion of real natural juice. Even the percentage of punicalagins in fruit and fresh juice is very varied, so we cannot be sure that we are getting enough. Another drawback is that the juice contains a lot of sugar and calories. Therefore, pomegranate dietary supplements are the easiest, safest, and most effective way of consuming the amount of punicalagins that the body needs daily. If you want to use pomegranate extract supplements every day in order to prevent the development of diseases, you should always choose a product with enough punicalagins. Look for products that have a complete spectrum of polyphenols and punicalagins, superior to a 30%, which is 180 mg of punicalagins per capsule. 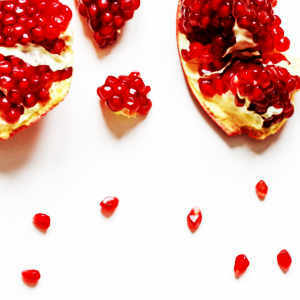 Punicalagins are found both in the pomegranate seeds, peel, and yellow membranes. The regular consumption of pomegranate extract supplements has medicinal benefits that regulate blood pressure, relieve inflammation, prevent the development of cardiovascular diseases, and regulate weight. Other benefits include protection against UV rays and a reduction of the risk of suffering from prostrate cancer and sexual dysfunction. Dr. Sergio Steinberger stated: "We have wasted thousands of years without fully taking advantage of pomegranates. Now, we have identified its extraordinary properties and benefits for the organism and know how to make it accessible to the public". "Our research has found a surprising list of medicinal benefits provided by pomegranate juice", Doctor Steinberger also claimed. "Pomegranates have been scientifically studied in recent years. Due to this, it has been proven that the benefits come both from the seeds of the fruit, skin, and inner sheath." In 2016, we already knew that punicalagins have antioxidant properties and benefit the cardiovascular system. In 2000, a pioneering Spanish study along with the University of California, proved that "the antioxidant activity of Pomegranate is based mainly on the hydrolysable tannins which are contained in punicalagins". Bioavailability is the key to an efficient use of a nutrient. Without bioavailability, it cannot be transported through the body. Punicalagins have a bioavailability percentage of around a 95% and provide a great variety of antioxidant properties. The uniqueness of punicalagins lies on their ability to act as if they were "polyphenol bombs", capable of being divided into several active metabolic "elements", such as ellagic acid and urolithins. Medical researchers who have been studying which food is the best antioxidant element for cardiovascular health, a healthy aging, weight reduction, and an increased longevity, have found that the best candidate is pomegranate. In 2016, it was discovered how its ingredients work. It is due to punicalagins, which are powerful antioxidants. Punicalagins are polinenoles of gallic acid which absorb and neutralise the free radicals and also have some other interesting activities, such as the regulation of inflammation and the protection of the DNA. Punicalagins are unique because once they enter the bloodstream they are easily metabolized and absorbed by the tissues of the organism. The interest in pomegranate has been growing since the year 2000. Since then, nearly 3000 scientific reports have endorsed the healthy characteristics of this fruit. The close investigation of pomegranate is currently focused on its medicinal qualities in the areas of inflammation, cardiovascular diseases, the regeneration of the skin and protection from UV rays. The benefits of pomegranate come from its high punicalagins content, ellagic acid, and certain glycosides (powerful antioxidant polyphenolic compounds). The pomegranate extract has a positive impact on the cardiovascular health of patients who suffer from atherosclerosis with stenosis of the carotid artery. High levels of cholesterol and triglycerides are some of the risk factors that are associated to atherosclerosis and coronary heart disease. The regular consumption of pomegranate extract protects the cardiovascular system and helps to prevent heart attacks. High blood pressure is one of the risk factors associated to cardiovascular disease. Dr. Steinberger studied the impact of pomegranate extract on blood pressure and came to the conclusion that it has an antihypertensive action which helps to prevent cardiovascular diseases and heart attacks to a greater or lesser extent. Therefore, pomegranate dietary supplements contribute to the maintenance of a good health and to the prevention of heart problems. The pomegranate extract has a beneficial effect on many inflammatory diseases, including arthritis and the inflammatory bowel disease. The bioactive compounds from pomegranate extract (polyphenols) reduce the inflammation by acting at the level of NFkB genetic transcription factor. The anti-inflammatory effect is similar to the one produced by ibuprofen. Dr. Steinberger analysed the anti-inflammatory effect of pomegranate by measuring the amounts of several cytokines involved in the inflammation process that are contained in the blood serum. It was proven that the quantities of proinflammatory cytokines IL1, IL6, IL8, IL12 (p70) and blood serum TNF were reduced with the consumption of pomegranate extract. The intake of pomegranate produces a reduction in the levels of 8-oxo-DG. This metabolite is an indicator of DNA damage. The consumption of pomegranate extract affects the functioning of many genes involved in various metabolic processes in the body. Many of these genes are in charge of protecting the body fromsituations of oxidative stress . The analysis of the participants' blood from the research showed no hepatic dysfunction or other anomalies after consuming pomegranate extract, which proves its safety for consumers when using the standard dose. Data from this study shows the antioxidant power of pomegranate extract in humans, whose results have been confirmed by other studies. Patients who suffer from erectile dysfunction state that their performance has improved after using pomegranate supplements. This is due to the fact that punicalagins stimulate the production of nitric oxide, a vasodilator that increases the blood flow. This has positive effects on the functioning of the erection. After 30 days of consuming pomegranate extract daily, all participants stated in a survery that they had experienced an increase in libido. The excessive exposure to ultraviolet-B radiation (UVB) and radiation (UV radiation) has several negative effects for the health of the skin, including redness, hyperpigmentation, and light-induced skin aging. Clinical research shows that the consumption of pomegranate extract protects the human skin cells from these harmful rays. Laboratory tests conducted in 2016 indicate a reduction of a 12% of cell proliferation in prostate cancer and an inhibitory effect on breast cancer. In addition, the bioactive compounds of pomegranate extract have anti-inflammatory, antiproliferative, and apoptotic effects on prostate and colon cancer. When the prostate is slightly enlarged due to age, herbal dietary supplements can relieve the discomfort. The most well-known cure is pumpkin seed, not only for relieving the need to urinate frequently, but it can also be administered when the bladder or prostate is inflamed. Saw palmetto, nettle root, and rye pollen are also good for treating prostate problems. In addition, the phytosterols contained in these plants also have other health benefits, such as reducing inflammation and swelling of the prostate gland, inhibiting the long-term enlargement of the prostate and preventing the development of prostate cancer.